This project is a versatile robot platform. We’ve gave it to possible usecases: a surveillence bot and a object tracker but there can be more. So, we’ll leave this to your imagination. As you can see from the picture above, the Android application controls the robot camera through the internet – not directly. The video streaming is using uv4i. It’s an interesting project for us, but at the same time it’s easy at all. Because of that, we’ll cover things from designing building a robot, to advanced configurations in Linux (Raspberry PI) to building an Android application and controlling the robot. Firstly, the android app shows the uv4l streaming inside a webview. The uv4l process runs on the raspberry pi, captures video input from the camera and streams it. It’s an awesome tool with many features. 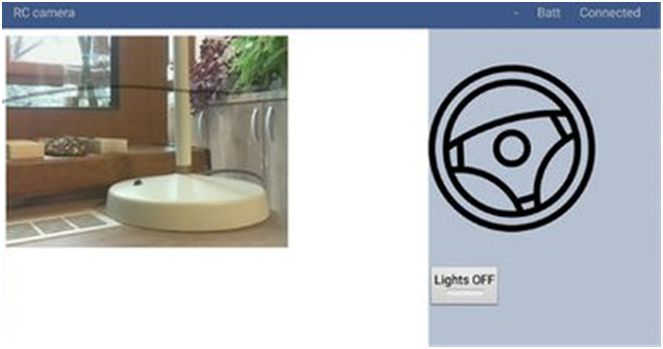 Secondly, using controls inside the Android app lights and engines commands are issued to the MQTT server. Thrdly, the Python server inside the docker container on the raspberry pi listens to MQTT commands and passes them using serial interface to the arduino. The arduino board controls the motors and the lights. 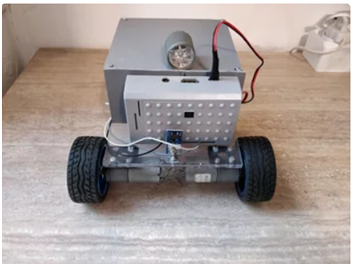 The arduino senses distances in front and back of the robot and sends the data through the serial interface to the python server, the python forwards them to the MQTT and they get picked up by the android interface and shown to the user.